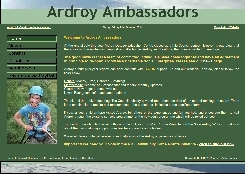 Ardroy Ambassadors This organisation provides a focus for all Ardroy's many supporters. You will find news of what is happening, the opportunity to join the growing list of helpers, or donate money, time and/or materials. John Muir Award Scottish-born John Muir was first to realise that the Earth's resources weren't inexhaustible, and so is regarded as the first conservationist. The John Muir award aims to pass on a love of the wild places to participating groups and individuals. Met Office Weather The Met Office is the foremost provider of meteorological and climate data, both in the United Kingdom, and across the globe. The link above goes to the Strathclyde forecast page; the logo, right, to the Met Office home page. 84 Hour Forecast Synoptic charts for the next three days. Mountain Weather Information Service has been going for some time, and is developing from a forecasting service, into a major resource for outdoor folk of all levels of experience. XC Weather seems to be one of the better weather sites just now. This link gives the local forecast for Lochgoilhead. MetCheck provide a quick snapshot of the weather. Link above provides the local forecast for Lochgoilhead, logo right goes to the Metcheck home page. Easytide Admiralty provided tidal predictions. Link above accesses local prediction for Lochgoilhead, logo right Easytide home page. Mobile Geographics Long-term tidal predictions for planning expeditions etc. Not guaranteed to be 100% accurate, but useful if contemplating a sea-kayak trip for example. Cormonachan Woodland is an area of managed woodland owned by Forestry Commission Scotland, and managed jointly by Ardroy Outdoor Education Centre, Lochgoil Community Trust and Lochgoilhead Primary School. Eco-Schools is a government initiative to cut fuel bills and promote environmental awareness in schools. Rhumhor is a beautiful self catering facility in Carrick Castle, just south of Ardroy. We occasionally deliver hill walking experiences and other instruction to their guests. Becky Duncan Photography who kindly allowed us to use some of her excellent images in this website, and our other publications. Trading as Social Enterprise, she both takes a mean picture, and is a very nice person! Green Tourism Award The Green Tourism Business Scheme assesses the environmental credentials of aspirant organisations operating broadly with the tourism sector, and awards the Green Tourism badge at bronze, silver or gold level depending on various factors - energy efficiency, waste management, sustainability and so forth. Ardroy holds the Silver Green Tourism Award. Lochore Meadows is an area of over 1,200 acres of beautiful countryside in Fife offering recreation and activities including mountain-biking, riding, watersports and golf. It is also the base for Fife's main provision of Outdoor Education. Mountain Training is the governing body for mountain sports - primarily hill-walking and climbing - in the UK. Scottish Canoe Association - the National Governing Body for all forms of kayaking and canoeing in Scotland. The School for Social Entrepreneurs (Scotland), who funded the development of this website, sponsored by The Bank of Scotland Social Entrepreneurs Programme. Thank you!